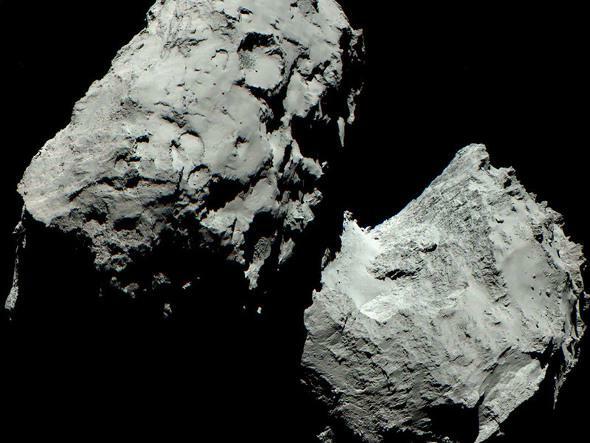 Rosetta’s comet: Gray but hardly dull. All the leaves were brown … and the lobes were gray…. That picture shown above is, seriously, a full-color photo of the comet 67P/Churyumov-Gerasimenko. It was taken by the Rosetta spacecraft on Aug. 6, 2014, when the probe was still 120 kilometers (75 miles) from the comet (long before the Philae lander was deployed). The OSIRIS camera on board has red, green, and blue filters that allow the camera to mimic what the human eye sees. It’s not exact, but it’s close. And what you see is … gray. Which means the comet really is just kinda overall gray. That doesn’t surprise me. Comets aren’t really loaded with the sorts of colorful minerals that make Mars or Europa or even our own Earth so gloriously hued. They’re mostly water ice and rock, with other things thrown in for good measure. But you might expect some variation when you look at the comet in detail. But it’s very smoothly gray; there’s very little change in the color composition across the comet. That means there’s probably physical homogeneity across its surface. If there are any interesting minerals or materials in the comet, they appear to be distributed pretty well. That does surprise me; I was expecting to see patches of ice at least on the surface, and those reflect blue light better than red. But we see no blue patches at all. The water ice in the comet is mixed in with the other stuff. That’s not the case with other comets; for example, Hartley 2 is also double-lobed, with a waist in between them, similar in shape to 67P. But observations using the EPOXI spacecraft show the waist is emitting water ice, while the lobes blow out more carbon dioxide. The waist is also smooth in appearance, while the lobes are rougher. It’s unclear why this might be. But 67/P, for all its similarity in overall shape, is clearly a different beast than Hartley 2. That’s telling us something. Perhaps they were born in different parts of the solar system, and so are constructed differently (we know that to be the case for some by looking at isotope ratios in different comets). Maybe something happened as they aged—4.55 billion years is a long time, after all—that changed them. It could be that 67/P’s outgassing and dust have coated its surface everywhere. Or maybe comets are just a diverse group, every one different from another. None of these circumstances would be surprising. There’s another possibility, too: Simulations of the early solar system show that our Sun may have stolen the vast majority of its comets from other stars! If that’s the case, then that would go a long way toward explaining why comets are so different from each other. They were born in different solar systems! It’s hard to express just how awe-inspiring that is. We’ve always assumed comets were like time capsules from the ancient solar system (if weathered and worn over the eons). But they actually may be samples of alien stars, transplants from elsewhere in the galaxy. Thinking about this literally raises the hairs on the back of my neck. So gaze upon that photo of 67/P once again, and think about what you may be seeing. I know I’ll never use the word “gray” to mean boring ever again.